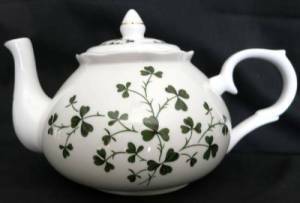 Bright green shamrocks decorate this six cup teapot by Adderley. Shamrocks are the symbol for Ireland. This teapot is not microwave oven safe, since it is trimmed in gold.